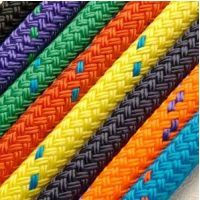 Braid on braid polyester rope. Good all round line, most suitable for halyards,reefing lines, flag pole rope, topping lift and all control lines. Non kinking, with abrasion resistant cover, High Strength, Excellent allround line and easy to splice. 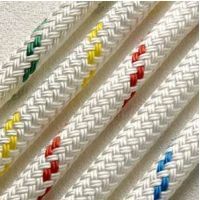 Cover: 16-plait out of 100% Polyester white with colour coding core: Low Stretch Quality plait out of 100% polyester, highly resilient.